** Molecules of chemical substances are made of two or more atoms joined together by some force, acting between them. This force which results from the interaction between the various atoms that go to form a stable molecule, is referred to as a Chemical Bond. ** A chemical bond is defined as a force that acts between two or more atoms to hold them together as a stable molecule. There is a fourth type of bond, namely, the metallic bond which we will consider later in this chapter. ** The term valence (or valency) is often used to state the potential or capacity of an element to combine with other elements. ** At one time, it was useful to define valence of an element as : the number of hydrogen atoms or twice the number of oxygen atoms with which that element could combine in a binary compound (containing two different elements only). ** In hydrogen chloride (HCl), one atom of chlorine is combined with one atom of hydrogen and the valence of chlorine is 1. ** In magnesium oxide (MgO), since one atom of magnesium holds one atom of oxygen, the valence of magnesium is 2. ** By the above definition, we would assign a valence of 2 to sulphur in H2S, but 4 to sulphur in SO2. Some elements have fractional valence in certain compounds, while there are elements that have variable valencies. ** The concept of valence as a mere number could not explain these facts. This concept, in fact, was very confusing and has lost all value. ** As already stated, there are three different type of bonds that are known to join atoms in molecules. Although no precise definition of valence is possible, we can say that : Valence is the number of bonds formed by an atom in a molecule. ** Valence is the number of bonds formed by an atom in a molecule. bonding. These electrons are, therefore, referred to as the valence electrons. ** The electronic configuration of Na is 2, 8, 1 and that of Cl is 2, 8, 7. Thus sodium has one valence electron and chlorine 7. ** It is important to remember that for an A group element of the periodic table (H, O, K, F, Al etc.) the group number is equal to the number of valence electrons. ** The valence electrons actually involved in bond formation are called bonding electrons. 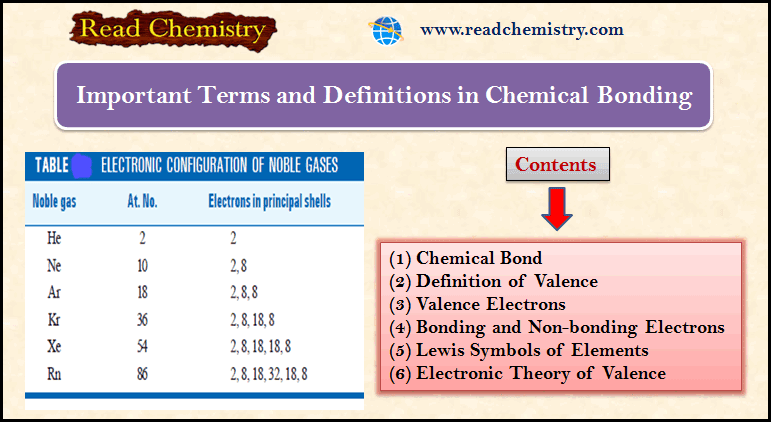 ** The remaining valence electrons still available for bond formation are referred to as non-bonding electrons. ** A Lewis symbol of an element consists of an element’s symbol and surrounding dots to represent the number of valence electrons. ** In this notation, the symbol of an element represents the nucleus plus the inner normally filled levels (or shells) of the atom. For illustration, the symbol Na stands for the nucleus of sodium atom plus 2, 8 electrons in the inner two levels. (1) write down the symbol of the element and surround the symbol with a number of dots (or crosses) equal to the number of valence electrons. (2) The position of dots around the symbol is not really of any significance. (3) The bonding electrons are shown at appropriate positions, while the rest of the electrons are generally given in pairs. ** The structural formulae of compounds built by union of Lewis symbols for the component atoms, are referred to as Electron-dot formulas, or Electron-dot structures or Lewis structures. ** For this purpose, the valence electrons actually involved in bond formation may be shown by crosses (x) or dots (.) for the sake of distinction. ** As Bohr put forward his model of the atom so electronic configuration of elements was known. G.N. Lewis and W. Kossel, working independently, used this knowledge to explain ‘why atoms joined to form molecules’. They visualised that noble gas atoms had a stable electronic configuration, while atoms of all other elements has unstable or incomplete electronic configuration. In 1916, they gave the electronic theory of valence. ** The electronic theory of valence states that : In chemical bond formation, atoms interact by losing, gaining, or sharing of electrons so as to acquire a stable noble gas configuration. ** Each noble gas, except helium, has a valence shell of eight electrons (see Table). ** While atoms of noble gases possess a stable outer shell of eight electrons or octet, atoms of most other elements have incomplete octets. They may have less than 8 electrons or in excess. Thus, the electronic theory or valence could well be named as the Octet theory of Valence. ** The Octet theory of Valence may be stated as : Atoms interact by electron-transfer or electron-sharing, so as to achieve the stable outer shell of eight electrons. ** The tendency for atoms to have eight electrons in the outer shell is also known as the Octet Rule or the Rule of Eight. Since helium has two electrons in the outer shell, for hydrogen and lithium, having one and three (2, 1) electrons respectively, it is the Rule of two which will apply. There are quite a few exceptions to the rule of eight in covalent compounds.